Safrien using a StyleShoots Horizontal machine to style and photograph an O'Neill ski jacket. We're talking with fashion stylists from all over in our new blog series. Recently, we had the pleasure of interviewing Safrien Duijser, a stylist working at the world's oldest surf and lifestyle brand, O'Neill. Read the first of our new series to find out what inspired her to become a stylist, and how a general day in the life of hers goes as she shoots and and styles the brand's new collections from her busy studio. It's a Monday afternoon and we've just arrived at O'Neill's European headquarters in Warmond - a village near Leiden, The Netherlands. A sprawling glass and concrete complex, the cluster of offices plays host to their business efforts across Europe and the UK - covering everything from marketing and content to sales and distribution. Advertisements and memorabilia from the 50's and through the 60's to the present day cover most of the walls as we make our way from reception toward O'Neill's Content and Marketing department. They've got a common theme, mostly showing off the hallmark style of the brand's eponymous creator - and creator of the world's first wetsuit - Jack O'Neill. Jack O'Neill developed the first wetsuit in 1952 to allow surfers to stay in the water for longer than ever before. We take a short detour through the distribution and sample warehouse and Safrien greets us in her photo studio. Inside, O'Neill's latest collections are hung on industrial-sized clothing racks - from ski jackets and hoodies to dungarees and shorts. Gratuitous amounts of styling inspiration print outs are stuck on the walls and a speaker blares out some light music. It's a fun environment to be in. Taking up most of the space in the studio are Safrien's StyleShoots machines. One StyleShoots Horizontal takes up the south side of the room - used for styling and taking shots of her clothes flat - and one StyleShoots Vertical - used for shooting on a mannequin - is situated on the opposite. She does all of her product photography on these 'big iPad looking things', according to her. She begins by showing me O'Neill's web store. "Right next door is where the live model photography happens - we hire a freelance photographer to get these kind of shots" she says, pointing to an image of a t-shirt being worn by a male model with the top of his face cropped out of view. "Here are all the products shot on StyleShoots" she adds, highlighting a selection of 'floating' product photos on white backgrounds. Not too long afterwards, we begin talking about her experiences as a stylist. Safrien's busy studio holds both a StyleShoots Horizontal and Vertical machine to allow her complete creative freedom over her product photography. So Safrien, what made you pursue a career in styling and fashion? And how long have you been working as a stylist? As a child I always had an imaginative and playful brain, intrigued by re-styling and customizing my own clothes. But I never knew there was such thing as a stylist and that it could be an actual job - let alone a career. So it wasn’t until 10 years ago I learned about this thing called ‘styling’. At that point I was very unhappy whilst studying Law. I immediately quit and began to pursue a career in fashion styling. This took me about 5 years, because I studied Art for four years during this time. I started working as a stylist during my second year of Art Academy. Straight out of the Academy I found my first job as a stylist and currently, I’m the Stylist for O’Neill Europe. And what kinds of tips would you share for others looking to pursue fashion styling as a career? Definitely try to study at a Fine Arts Academy if you can. It really opens up your way of thinking, creating, and conceiving new ideas. Even more importantly, finding a great internship really helps. More than half of what I have learned about styling I learned during internships. That's why I always tell my own interns to ask me as much as they can. "To be part of such a rich heritage and work with that every day is really special. We have a really rich archive from past decades." 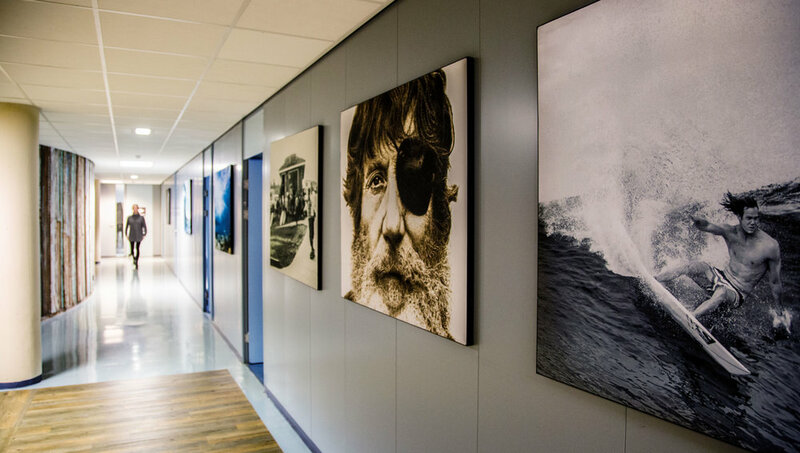 Apart from the amazing workspace, what’s so interesting about working for O'Neill? Ah! O'Neill has a really interesting, super rich heritage. Back in 1952, Jack O'Neill invented the wetsuit. Previously surfers could only go surfing in the water for short periods of time, but with the wetsuit people could stay in the water for hours. To be part of such a rich heritage and work with that every day is really special. We have a really rich archive from past decades. Right now retro is really in, that 90s kind of style is back. The 70s skier look is also getting really popular right now. Styling products is just one part of Safrien's responsibilities. She also styles models and the production of O'Neill's style guides. Do you mind taking me through a regular work day here at your studio? It’s a varied job. Sometimes I have a model shoot in the studio next door. Those take up the whole day. Other days, I spend doing a lot of research on fashion trends, fashion photography, looking for new models, hosting model castings, producing fashion shows and creating style guides for our collections. Other days I spend shooting products on the StyleShoots Vertical and Horizontal for our web shop. You mentioned creating style guides, what’s the process there like? We tend to make a new style guide every season. We come out with two collections every year (Winter and Summer) and take our inspiration from the previous year by thinking about things like: how did it change, how can we change it, how can we make it better? Ultimately, we know we need to grow our e-shop photography and our model photography, so our style guide reflects that, and changes every year. What inspires you? And where do you look to for inspiration when styling new collections? It all starts with opening your eyes and just looking around. I always try to be aware of what is happening around me. Following the big fashion houses is one thing, but good trends can come from anywhere. Far more often we see that streetwear and street style influences the fashion trends. And it’s interesting how these trends can be found in so many different places. My favourite thing is just to study people as they live their lives. We're so influenced by what we see on the street - especially looking at street photographer's works. Of course there’s also social media, which is a great source for spotting trends all around the world quickly. When learning about how to research trends, the first thing you learn is watching all of the fashion weeks and knowing everything about the great fashion houses. We also have a popular lifestyle collection - besides being a big brand in ski and surf. You previously mentioned you style a mix of both model photography and product photography - do you have a preference? I don’t have a preference, both can be really exciting, with product photography, people tend to not give it as much time as they should. I remember back to a previous owner of a denim company I worked for. He would take a whole day to photograph just one garment - almost like a surgeon trying to make his stitches really crisp and perfect. You need that time to put in there to make it perfect. That’s where product photography can be really exciting. So you’d say product photography can be almost like a science? And how many shots a day do you tend to do? Who shares the responsibilities? We generally tend to schedule about 30-35 shots a day. Some products more difficult than others, which obviously takes a little more time to style. But what we try and do is keep our quality really high - we can’t give our retouchers too much to do, 10-15 minutes per image of retouching work maximum. "And besides my intern I have a Junior Stylist who helps with styling inspiration - like those pictures you see that I stuck up on the wall over there." "The StyleShoots machines are great tools to play around with - you can do far more with the lighting than you might think"
Stylists are under a lot of pressure to produce great shots in a quick timeframe, what are some of the biggest challenges you've faced in your work? Production can be brutal. Sometimes I would love to put a bit more time in the garments that I shoot, but a tight time schedule does not always allow me and my team to do so. When I first started using StyleShoots, the machines were there just a month before I was. I remember using them to get through so much work every single day, eight hours a day. Finally, I remember back when we talked the other day - you mentioned you like getting creative with StyleShoots machines. What tips would you recommend to other stylists in getting great shots out of it? The StyleShoots machines are great tools to play around with - you can do far more with the lighting than you might think. As we speak I am testing and exploring new ways to utilize the machinery and lighting in the best way, and most imaginative ways possible. Thanks for your time Safrien. We really appreciate it. Anytime. Thanks for coming down! Safrien Duijser is a stylist working at O'Neill. We'd like to extend our thanks to her and the whole team at O'Neill who made us feel extremely welcome during our stay.